This historic city offers a lot of interesting sites, one being the Frans Hals Museum, which boasts the best collection by, whom else, Frans Hals. We spent over two hours wandering rooms hung with a variety of pictures and decorated with floral arrangements, which are works of art themselves. Thanks to the recommendation by other cruisers we obtained the national museum card providing admittance to over 400 museums during one year. Having purchased the card at one of the larger museums in town, we subsequently discovered the person selling us our cards didn’t really provide all the information we needed to take advantage of this annual membership (this has rarely been our experience with the Netherlanders so it was a bit of a surprise when it occurred). We later corrected this misunderstanding with the help of a great couple running a local cafe, the Downtown Coffee shop. The owner kindly translated the Dutch website letting us use their business address to register the cards. It wasn’t until I got to the end that I noticed they’d be mailing us our annual cards (our temporary ones only lasted 31 days) to this business. Not a problem he said. They’d just email us when they received them. And, this is the typical type of interactions we’ve had in this country! Back to Frans Hals… the woman behind this museum counter couldn’t have been nicer (I seem to use that description a lot around here) giving us more complete information about our museum cards. She also mentioned we were fortunate to visit during this time of year due to the flowers complementing the artwork. She was right about that as a large and elegant array greeted us as we rounded the corner towards the exhibits. With a map and audio guide we stepped back into the 17th century noted as the Golden Age of Dutch Painting. Art flourished during this time period due to the strong economy in the Low Lands. Even with the strife of the civil war (battles lasted until the signing of the Treaty of Westphalia 1648) and no local patronage by royalty or the Catholic Church (the late 16th-century rebels up north formed the Union of Utrecht promising unheard of religious freedom and a switch to less elaborate church decor), a growing middle class grew into a new purchasing power. Art became a business, and many took up the brush to cash in on this thriving industry. So many tried their hand at painting the increasing competition meant a large group of highly skilled artisans rose to the top of their craft. They did so by focusing on what the merchants, shopkeepers and other buyers wanted. Now landscapes and still lifes hung alongside the traditional portraits and religious scenes. Other famous works by Hals were the portraits of Regents and Lady-governors. Comprised of prominent men and female spouses of wealthy citizens, these appointees by the local magistrates oversaw what we’d call today non-profit organizations offering social services for the less-fortunate. These paintings reflect the communal caring orchestrated by each city’s magistrates who felt both a Christian and a civic duty to take care of their poor. These lay administrators (aka Holy Ghost Masters) to manage outside relief agencies (distribution of food and clothes to those who had homes but needed fundamentals) and almshouses (those requiring shelter as well). Thus, this country created a de-centralized social safety net city by city, based on a Christian principle of charity but evolving into a municipal responsibility as early as the 1400s. One of Hals last group portrait featured “Regents from the Old Men’s Home” (1664). Later in the 19th century his imprecise style was criticized; however, with the rise of Impressionism, Monet and Manet actually visited Haarlem to study Hals Regents painting. Ironically, Hals became a recipient of the city’s charity becoming a pensioner in the last years of his life, a sad fate, which befell many talented individuals. Those large-scale works were impressive but so, too, were the individual portraits Hals painted, such as the one of Haarlem’s mayor in 1630, Pieter Jacobs Olycan. Also, note the wall, which is hung with leather embossed panels. An earlier painter who obtained valuable commissions from town leaders was Cornelis van Haarlem (1562-1638 ). 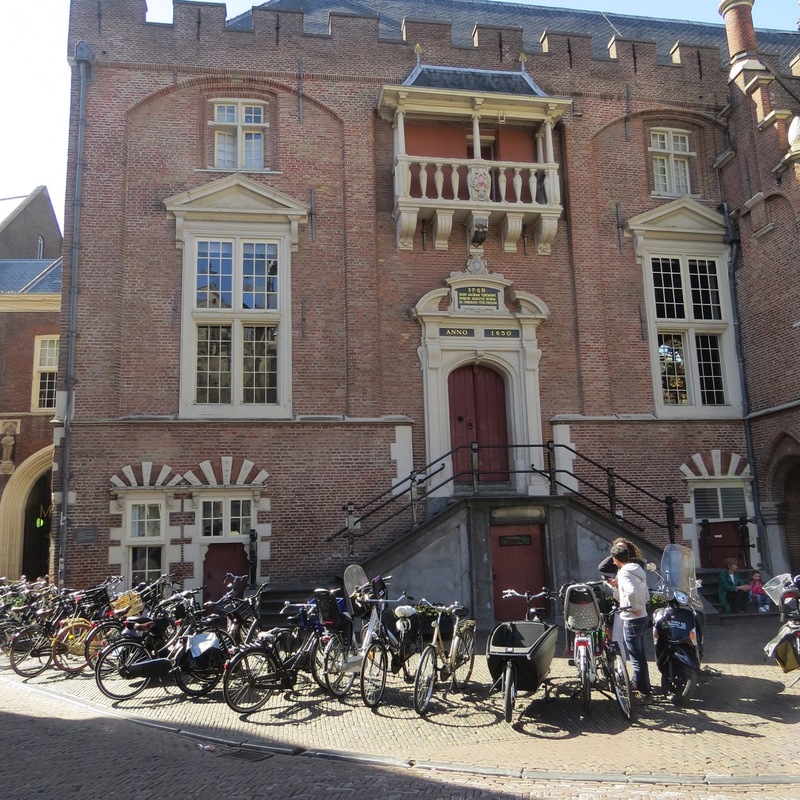 In 1590 he became famous overnight thanks to the town council asking him to paint four scenes for the Prinsenhof, a guest house for visiting Dutch stadholder (stadholders were basically the aristocracy of the Low Countries). He painted himself in, too (top row, second from left). Not an uncommon trait to find artists making a cameo appearances in one of their works. Frans Hals children also contributed to the art scene. One by the third son, Jan Fransz Hals, is “Children at Play” (1635). Daily life events also featured in artists’ paintings. Jan Steen, another local artist, depicted peasants in various activities. Although his art carried a humorous and sardonic tone, the overarching theme was to amuse and yet warn upper classes away from temptations as shown by His “Village Fair” (1665). This painting speaks to the dangers of drunkeness and licentious behavior. Looks more like a good party to me. Haarlem was known for its fine linen, and one oil painting showed hundreds of feet of cloth stretched out to dry in the sun. Interestingly there was an ongoing feud between the city’s beer industry and the linen one because both needed clean water. The breweries won and the linen producers were forced to find other sources further out of town to create their bright white cloth. Another topic reflected by artists was Tulipmania. The tulip, whose name is derived from its country of origin: Turkish for turban, was introduced in the 16th century and later propagated by the scientist and botanist Carolus Clusius in Leiden, roughly twenty miles south of here. Haarlem became the main center for cultivating these desired flowers. The tulip became a commercial entity with speculators vying for the most exotic bulbs, ones they could display as proof of their wealth. One example: a bulb was purchased in 1623 for 1,000 guilders. Within two years it doubled in price, and then rose to five times the original price in 1637 (the cost of a canal-side home or $90,000 in today’s currency). When the demand all of a sudden fell in 1637 (probably someone woke up and realized it really was just a flower) many wealthy and not-so-wealthy speculators fell into bankruptcy. Satirical paintings sprouted up as a result of artists poking fun at this frenzy all in the name of a bulb, and this museum featured a few. The picture below painted in 1640 portrays the flower goddess Flora accompanied by three men in fool’s caps. The cart is heading towards the sea and a certain sinking followed by some investors, Haarlem weavers. Not all were paintings. One exhibit was an elaborate doll house from the mid-1700s. Evidently, doll houses began as a collector’s object with prosperous homes showcasing miniature furniture and accessories. The owner of this doll house, the wife of Jacob Ploos van Amstel, sewed some of the items herself. She, her husband and mother-in-law are featured in the portrait below. The same artist actually painted some of the pictures hanging in these miniature rooms. That alone illustrates how valued these doll houses were. As promised by the woman who checked our card flowers brought spring inside as we toured the various rooms. I gazed at these almost as much as I did the paintings. This entry was posted in 2016 04 NETHERLANDS, 2016 Summer Cruising, COUNTRY, Europe, Netherlands, SUMMER CRUISING on May 2, 2016 by margaretlynnie. Wow the flowers are stunning and really brighten up those dark paintings. One arrangement looks exactly like a Van Gogh painting…..